I thought I would do a general wrapping up post for the year. It has been a pretty interesting year, since sales were good overall, but not really in terms of new releases. It was mostly my older stuff carrying the day. I will say that the Renaissance infantry did come into its own towards the end. The second half of the year was kind of plagued by delays and complications, including the work needed to start fulfilling the Polyversal Kickstarter pledges. I expect the mutie expansion might do okay as proxies. I plan on rounding out the range with some modular monster trucks and war rigs, a few more medium pursuit vehicles, and some “Law” vehicles and personnel. After that, expansion will be dictated by sales. Modular supertank and friends will be released as the army of New Terra (because it is shorter to type than modular supertank and friends). These guys have been a bear to release, and were poised to come out weeks ago, except for a previously unidentified casting defect on the side missile sponsons. Basically, one missile was broken off, and looked like it was fired already. I was tempted to just release everything as is, but after putting so much money and time into it, I would rather everything come out perfect. The replacement missile sponson has been ordered from the printers, and I’m hoping I can get squeezed in priority by the moldmaker, since it is 1 measly little part. Expect to see the entire line up for preorder in January 2017. 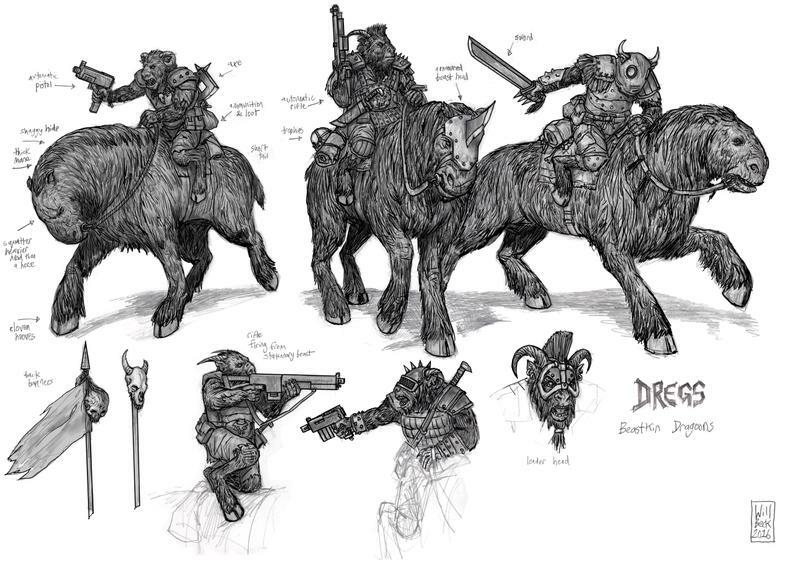 In terms of other stuff, I am thinking about vehicles for the space rats, releasing a desert-themed space faction (infantry already sculpted), and I have all the concepts done for a scifi beastmen race I am calling the Dregs. I will preview the art in the coming days. No really solid release dates for any of this. In terms of standard archetypes, it really just leaves the Kingdom of Light army I have been planning for literally years. After that, I can start doing some really wacky stuff, but the priority is releasing the stuff above. I know, I know, kind of against the 6mm roots. I own a bunch of 15mm fantasy myself though, and I have a desire for some centerpieces and esoteric stuff. What good is a miniature company if you can’t indulge yourself once in a while? First releases should be out in January 2017, some demon infantry packs and a couple of super awesome resin centerpieces. 3mm scifi…I have been bitten by the bug. I am looking to do some really alien advanced tanks and such, since it seems they are lacking a bit right now. No idea on a timeline for that, beyond some soonish digital sculpting. Fantasy Naval - my concept artist has expressed interest, and Spartan Gasmes has said they are not bringing back Uncharted Seas. I also felt the ships for that game were a bit big for my taste. Not sure if it will go into production next year, but will definitely be getting the art doine for the first 4 factions and some preliminary sculpting. 6mm Historicals – I plan on doing the entirety of the Bronze Age. It is actually a ton cheaper to release stuff for than fantasy, because less monsters and cavalry and such. I figured I can expand later with mythological elements as well. Again, no idea on timing. And because everyone likes previews, here is a smattering of art. I will do some dedicated art preview posts over the coming weeks also. Any preview for the desert themed space infantry ? 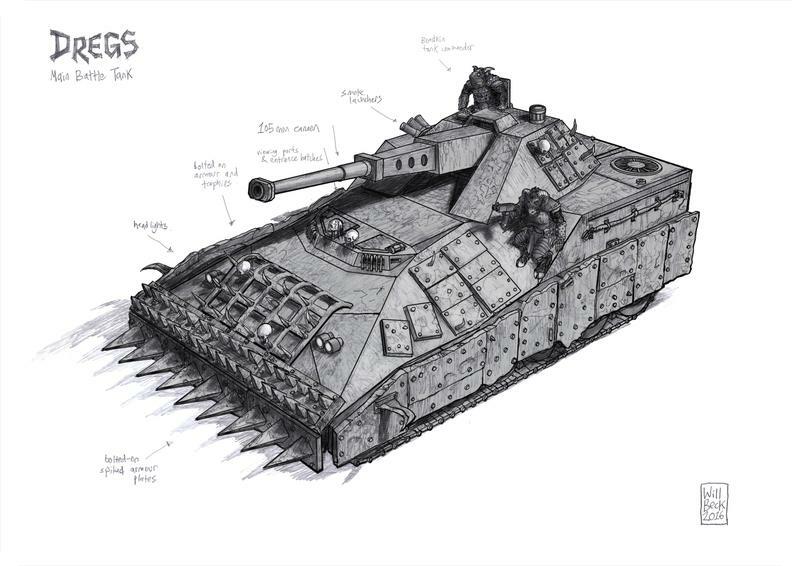 Nice looking designs I particlarly like the beastman tank i'll be getting some of those for my own collection. I would like to import more of your stuff but obviously your catalogue is a little big to hold everything so i'll be stocking those items I think will be usable with my other ranges for the most part so dregs, demons some creatures, continue to stock the wasteland range and maybe the new super tanks amongst others. I'd be happy to receive suggestions on what to stock from customers and before you say the entire fantasy range i'll say this maybe one day but not now. One thing i'd be willing to do is take fantasy orders and when I have accumulated a certain number i'd add them to any re-stock orders i'm making. It would mean a possible big delay for the customer but you would get that order without import duty to pay so if you'd be interested in that please let me know. There is a company over in the UK that already do Bronze Age historical "Rapier Miniatures"
Wow sounds like a great set up for 6mm fantasy . hopeful in particular for ratmen this year as my eyesight getting worse the older I get and would love to get them under mybelt before it goes completely lol. The additions to the undead range sound great too and the concept art looks wonderful. Looking forward to spending lots of money with you I 2017. Hopefully Trump will really screw something up and the exchange rate with the UK will improve! Great undead indead, one of my favourite ranges! Looks very interesting. Looking forward to see more of the dreg, do they use any other races? minotaur and so on? Do you plan on making a full army out of the line? Artillery, transports, titans and so on? 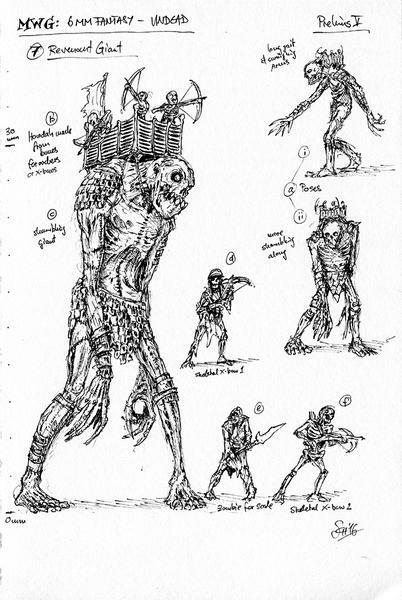 The undead platform giant is awesome, how many do you plan on selling together? 1, 3 or more? The elves are really nice, but dont think ill end up playing 6mm fantasy, as i already play 10-12mm. Do you plan on making them in 3d? if so i think it should be fairly easy to give them scifi weapons and give us another choise for eldar. As Lyle asked, what about these guys ? Lawrence on the Left ... not Tommy on the right ! Thanks for the update, that all sounds great. I look forward to more of the renaissance line, as I'm using it for three armies (in whole or in part) at the moment in my 6mm WHFM project. The rest of the fantasy plan sounds great too, the Egyptian Undead and general Undead news probably got my heart pumping the most. I got a small MWL order in as part of my last order but I was hitting my $ limit so I didn't go in whole hog yet, but I plan on filling that out soon with the infantry and more vehicles. The additions sound good too, I think in the long term it's probably the vehicles that will be the best draw for the line, since everyone wants to play Mad Max and not everyone wants to convert Hotwheels and Matchbox cars! I'm also in for the supertanks, though they're going into the MWL project as some of the lost remnants of pre-disaster tech. I'll just wrap up with my annual suggestion that the world really, really needs a fulsome 6mm Halfling range! Specifically Halfling archers, but it's just a small step (see what I did there?) to a full range. And it would fit in with the standard fantasy archetypes! The dregs use minotaurs and trolls as well. I plan on making them a full range, I hadn't really thought about titan-sized things though. I'm not sure they could keep it functioning. They will have everything else though. The revenant giant will probably be 2 per pack. I was holding up on the desert guys until I had there support weapons sculpted, but the artist has been super delayed due to other work, so I may just go ahead and release what I've got. Maybe by April. I know, halflings would be a good addition. I promise they are on my list. I actually think the muties could work for fantasy as is. Their weapons reach the blunderbuss tech level at best, so I don't think they would be too amiss. They will be sculpted in 3D, mostly to control their actual size and chunkiness.